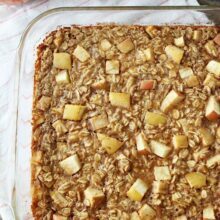 Baked Peanut Butter Apple Oatmeal-this easy baked oatmeal recipe will remind you of your favorite snack! It reheats well, so make a big pan to enjoy all week long. 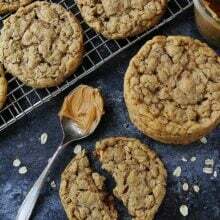 Remember when I made Peanut Butter Apple Oatmeal Cookies? Well, I’ve made them a dozen times since I first shared the recipe on the blog. They are one of my very favorite cookies. The problem is they don’t last long because I am a cookie monster. If cookies are on the counter or in the freezer, I will eat them. They don’t stand a chance with me around. The problem is I found myself eating my Peanut Butter Apple Oatmeal Cookies for breakfast far too often. There are healthy ingredients in the cookies so I thought it was A-OK to have a couple for breakfast. I thought it was fine until Caleb, our three year old, told me that we aren’t supposed to eat cookies for breakfast. Oops! He caught me! Baked oatmeal is one of our very favorite breakfasts. A few of our favorite recipes include our Blueberry Coconut, Peach Almond, and Apple Cinnamon. 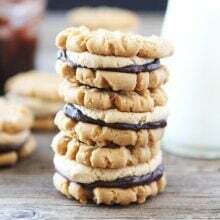 Thanks to my cookies, I invited peanut butter to the party for this recipe and I am so glad I did! 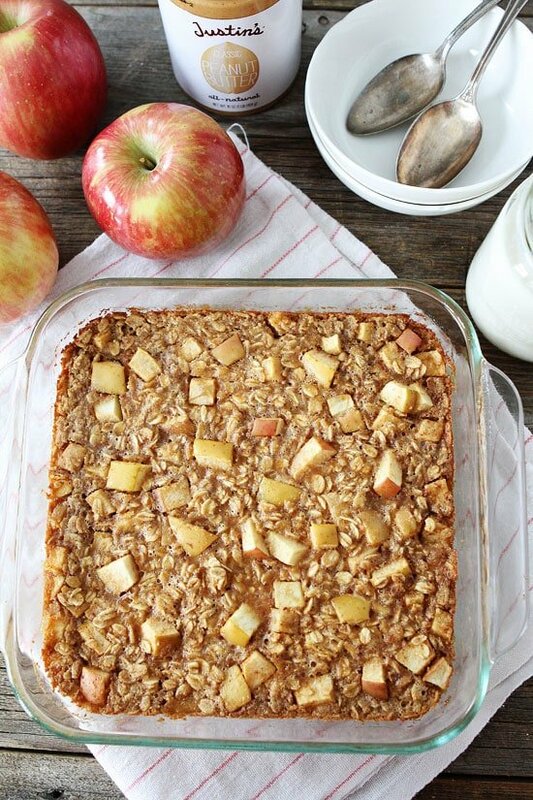 The peanut butter, apple, oatmeal combo is a winner…again! I love making a pan of Baked Peanut Butter Apple Oatmeal on Sunday morning so we can enjoy a special Sunday breakfast and then have the leftovers throughout the week. 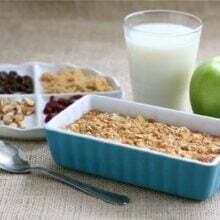 Baked oatmeal reheats great in the microwave. I just add a little splash of milk to perk it up and BOOM, you have a delicious and nutritious breakfast in seconds! And the good part is, this baked oatmeal still feels like you are eating a treat for breakfast because it is so good! 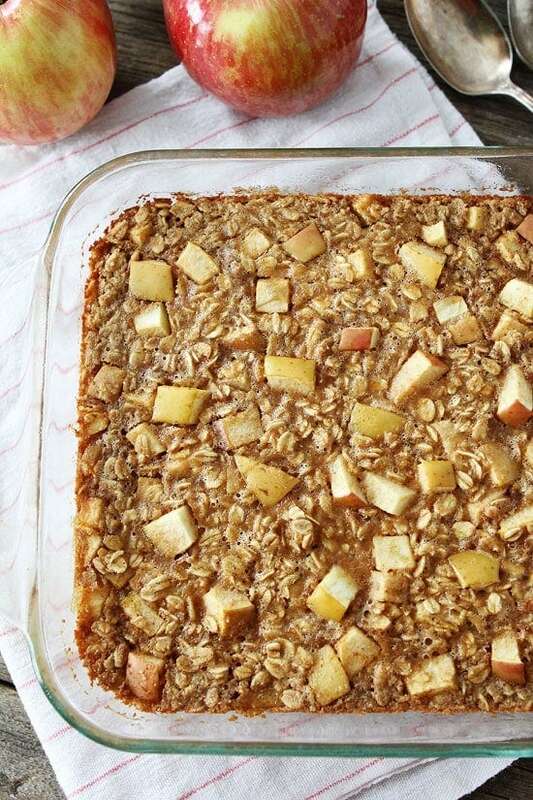 So go ahead and treat yourself to a pan of Baked Peanut Butter Apple Oatmeal. It is mama and toddler approved! Enjoy! 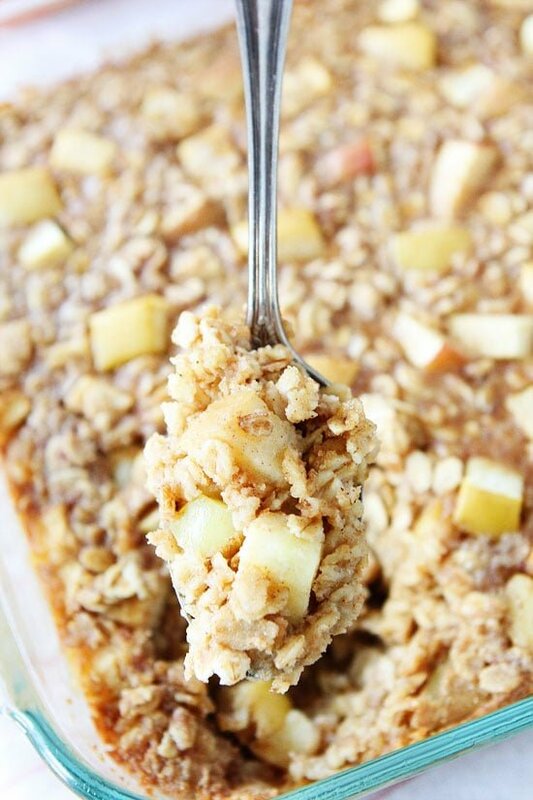 This easy baked oatmeal will remind you of your favorite snack! Make a pan and reheat the leftovers during the week for a healthy and easy breakfast! Preheat the oven to 350 degrees F. Grease an 8 x 8 square baking dish and set aside. In a large bowl, mix together the oats, brown sugar, baking powder, salt, and cinnamon. Set aside. In another small bowl, whisk together the milk, egg, applesauce, and vanilla extract. Pour the liquid mixture over the oat mixture and stir to combine. Stir in the peanut butter and mix until combined. Add the apples and stir again. Pour mixture into prepared pan. Bake for 35 minutes or until the top is golden and oatmeal is set. Let cool for 5 minutes and serve warm. Note-this baked oatmeal is great reheated in the microwave. We like to make a pan and eat it throughout the week. This recipe can easily be doubled for a 9 x 13 pan. Use gluten-free oats to make this recipe gluten-free. You can serve with brown sugar, an extra splash of milk, cinnamon, or raisins if desired! Now this would get me out of bed in the morning! PB and apple is such a wonderful combo. Yum! I’m going to the store to grab the ingredients first thing in the morning! oh gosh! So yum. This would be a hit to bring to a brunch party too!!! Love everything about this especially the flavors and ease of prep! I’m a huge fan of baked oatmeal. Love how this is just slightly more indulgent. When you reheat, do you reheat the oatmeal and then add the milk or add the milk first and heat it all up together? You can do either, but I usually add a splash of milk before reheating. Baked oatmeal is my favourite!! I’ll have to try this version out! I would never say no to a bowl of peanut butter and oatmeal! Looks amazing, Maria! YUM! I love oatmeal. So versatile, so easy to take on the go! It looks like the texture is thick, does it reheat well? How long does it keep? Do you store it in the fridge? I can already tell this is going to be a fall favorite of mine! Yes, it reheats well. I like to add a splash of milk before reheating to liven it up! It will keep in the fridge for up to a week. This looks so good! What a delicious breakfast! I eat oat bran with flax seed meal almost every day. Might give this a try. Sounds good. I make a different flavor of baked oatmeal just about every week in the winter. I love your blueberry coconut, although this week I did pineapple coconut because I’m longing for the sun and sand of a tropical island!! I bake mine in a muffin pan for easy portion control, and then either refrigerate or freeze the muffins. Peanut butter and apples is a favorite snack in our house so can’t wait to try this version!! Sounds great, do you have the nutritional information for this? 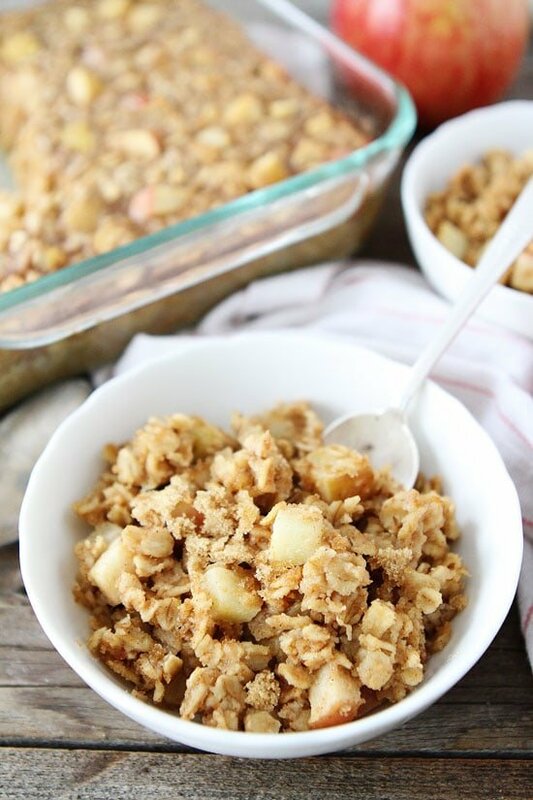 Apples and peanut butter are one of my favorite childhood combos so this oatmeal looks like a big dish of heaven to me! And I’m the same way with cookies. The Cookie Monster definitely comes out whenever they’re around. I cannot be trusted! I love that you turned your cookie into oatmeal! Bonus for us that you didn’t want to set a bad example. Breakfast doesn’t get any more yummy than this! I see the words, “reheats well” and get excited, especially when it comes to breakfast. Perfect for weekday mornings! Love, I just made a peanut butter baked oatmeal version too! They are a great healthy option for breakfast! I’d eat this everyday for breakfast if I could. 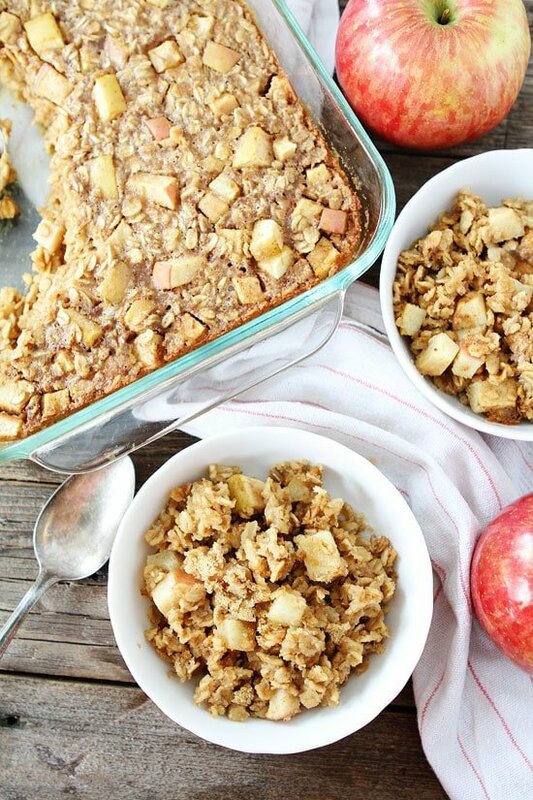 What a great way to change up baked oatmeal, Maria! 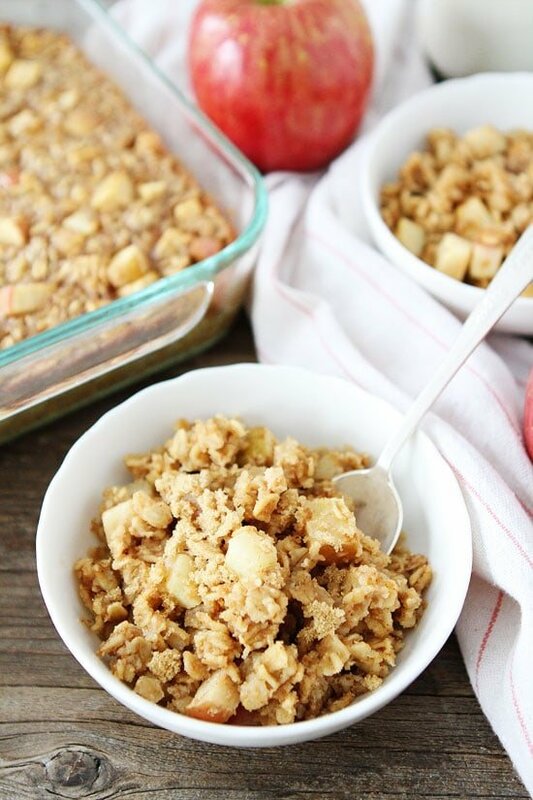 I love baked oatmeal, but haven’t made a PB version…so good with apples! Definitely have to double the batch because there’s nothing like having breakfast ready in advance! I love the sound of this recipe but looks a little dry? does it taste dry? I am thinking of making it for guests I am having over this weekend! I don’t think it’s dry but you can add more milk if you want. do you know if this can be made without egg? I haven’t tried it without an egg. Maybe try 2 cups of milk? Without an egg, it will not bind together properly and the texture may turn out weird. You could try using a vegan egg substitute instead, but leaving out the egg altogether would most likely not work. Just in case somebody is looking for an answer to the same question: it works great without an egg. You can add more applesauce or add a mashed banana, since both are great egg substitutes. Thanks for the baked oatmeal recipes! I am addicted! I love the blueberry coconut oatmeal – I add some wheat germ and slivered almonds and cut the sugar by 1/2. It’s great! Can’t wait to try the apple peanut butter! Can’t wait to try this recipe! Is it really sweet? I don’t like super sweet things. I might omit the brown sugar if that would work…. can i use honey instead of brown sugar? I haven’t tried honey, but I am sure it will be fine! I love your blog! I have been following it for a few years now! Your photography skills are amazing and make me crave the food even more! Just like you, I love to eat cookies for breakfast! This recipe is on my To Do list. I can’t wait to enjoy ‘healthier’ cookies for breakfast! I might try it with adding in dried cranberries, chia seeds, and honey. Thank you for posting! This is a perfect breakfast for our busy mornings! 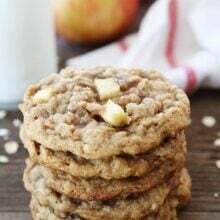 This looks as good as the Peanut butter apple oatmeal cookie recipe. I have celiac so I substituted Pamela’s gluten free flour mix ( I have also used the gluten free flour recipe from America’s Test kitchen) for the regular flour. Because I was using gluten free flour and did not want the cookies too wet I substituted cranraisins for the apple but any raisin or chocolate chip would be good also. I followed the recipe exactly and it is my “go to” cookie recipe. I would not change anything in this recipe other than to swap our the flour and consider not putting in the apple. Wonderful recipe! My bff and I start our day off with oatmeal almost daily. so I made a double batch this morning… yummo… It wasn’t sweet enough straight out of the pan for me but a bit of butter and brown sugar did the trick. The only change I made was to substituted 1/2 cup of raisins (1/4 c for a single batch) for the same amount of diced apples. (My bff is really attached to raisins cooked into his oatmeal, and is worried about too much change to his morning meal.). Made this for mt sisters and friend this weekend when they visited me. It came together so quickly and was soooo good!!! We devoured it. I had commented earlier that I was afraid of the oatmeal being too dry but it was not at all. So happy with how it came out. Thanks for the recipe! This is in the oven now! Can’t wait to have for breakfast this week. I love peanut butter and apples together. Thank you for sharing this awesome combo! This was amazing. Made with Granny Smith apples. Can’t wait to try the blueberry coconut oatmeal. Do you think it would work well to make this ahead and then bake it off the following day? I really love your recipes! Thanks so much! I have only reheated it. It might get too soggy making a day ahead. This looks delicious, Maria! Can I use steel-cut oats? Now that looks good! Dollop on a big ol’ scoop of vanilla ice cream and call it dessert! I make this for my husband and I almost every other week. It’s safe to say we are OBSESSED. Thank you for all of your yummy recipes. I do a lot of research on different blogs before I decide to actually make a recipe. Your blog hasn’t let me down, though. Everything I have made has been a hit! I have made this recipe at least once a week since it was posted. We love it! My 2 year old will ask to “make oats?” first thing every morning. It’s wonderful! This recipe looks delicious but I accidentally bought quick cook steel cut oats. Will these work? Thank you! What if I don’t have any applesauce on hand? Can I still use the recipe without the applesauce? Could I use almond milk in this recipe? Looks so good! Loved this – the cinnamon and vanilla were so fragrant, and the finished oatmeal had a surprisingly substantial texture. Thank you for sharing! Delicious, simple and seasonal! This recipe made my house smell soooo good. My new fav, healthy breakfast bake. Thank you! We LOVE this recipe in our house. I’ve made these about half a dozen times and they get eaten by all of us (my oatmeal-skeptical husband included)! My 22 month old started eating these when he was self-feeding. I make them in a muffin pan (it makes about 11 muffins) and freeze a portion. They freeze beautifully! So glad you like the recipe! I love it too! Can you freeze this? I’m expecting twins mid March or early April and trying to stock the freezer before their arrival. Just made this for breakfast and added a dollop of Greek yogurt on top. Delicious! Glad you liked the oatmeal! Made this for breakfast this morning and it is SO TASTY! I subbed Splenda brown sugar baking blend for the brown sugar and used a little extra apple (didn’t want to have extra partially chopped apple lying around) but otherwise didn’t make any tweaks. I love that it’s flavorful and rich but healthy and guilt free. Definitely going to try your other baked oatmeal recipes. Yay! We loved baked oatmeal! I’ve made this recipe a few times now and in my opinion, it can’t be improved upon. It is breakfast perfection!! Thank you! So glad you like the oatmeal! I made this for the first time last weekend and it was one of the easiest and most delicious breakfast dishes I’ve ever made! I went ahead and doubled it so it would last the week – what an easy way to have breakfast in the morning! I’m looking forward to making this again and will certainly make it regularly for my family. can you use steel-cut oats with this recipe? Looks delish!! Do you think you could substitute part of the oats with steel cut? Thanks! This is absolutely fantastic! It tastes just as good reheated this morning as it did after it came out of the oven yesterday. Thanks so much for this great recipe! So happy you liked it! That granola is a winner too! Enjoy! Thanks for an awesome breakfast that’s easy, healthy, tasty, and great to make ahead for busy mornings! I have made this many times, so I have played with the ingredients. I use unsweetened vanilla almond milk, PB2 instead of peanut butter, and I throw in flaxseed. Banana is a good addition. This was so good! I used almond milk instead of skim milk and it worked just fine. I was searching for baked oatmeal recipes and these photos stopped me in my tracks! Can’t wait till it comes out of the oven. Smells great! I doubled recipe to a 9×13 pan and used all the apples I had, about 4 cups diced. I also did not add the applesauce as I didn’t realize I had none till I had already started recipe. It came out perfect in my opinion. Im making it tomorrow sounds really good and easy. Thank you. This was so yummy! Nice texture and not too sweet. I made baked oatmeal from a different site and it was heavy and gummy. Not this one! Going to try some of your other variations next. Thanks for a new breakfast/snack option! I look forward to making this recipe each year after going apple picking! Everything about this is perfect! Sometimes the apples don’t measure exactly to the recipe,I’ve added extra and had no problems! This is great for breakfast, a snack, or even for desert with some chocolate chips on top (they get melty and delicious and it’s heavenly)! Thanks for sharing such a winner! IS there a way you can make this egg free? I love this recipe and plan on making 2 9×13 pans for a brunch. Can I prep this the night begore and bake it in the morning? Made a pan this morning for the first time and turned out great! I found this while looking for recipes to use up all the ingredients my old roommate left behind. That being said, I substituted some things just to use what I had. For anyone looking in the comments about substitutions, here were mine! -I added a ton of raisins! Can coconut sugar replace the brown sugar? Other than coconut sugar, what natural sweeteners can be used?